Create the dsp.LogicAnalyzer object and set its properties. For more information about how to configure and customize the Logic Analyzer, see Logic Analyzer. scope = dsp.LogicAnalyzer creates a Logic Analyzer System object, scope. scope = dsp.LogicAnalyzer(Name,Value) sets properties using one or more name-value pairs. Enclose each property name in single quotes. For example, scope = dsp.LogicAnalyzer('BackgroundColor','White','NumInputPorts',4). Background color of the display, specified as 'Black' or 'White'. Color for channels in the display, specified as an RGB triplet. Font size for channels in the display, in points, specified as a nonnegative integer. 'Automatic' — Displays floating-point signals in Analog format and integer and fixed-point signals in Digital format. Boolean signals are displayed as zero or one. 'Analog' — Shows values as an analog plot. 'Digital' — Shows values as digital transitions. Channel height in the display, in pixels, specified as a positive real scalar in the range [8, 200]. This property applies only to fixed-point (fi) values. Spacing between channels in the display, in pixels, specified as a positive scalar integer. Caption to display on the scope window, specified as a character vector or string. Position of the scope window on your screen, in pixels, specified as a [left bottom width height] vector. The default position depends on your screen resolution. By default, the scope window appears in the center of your screen, with a width of 800 pixels and height of 600 pixels. Sample time of inputs in seconds, specified as a finite numeric scalar. The same sample time is used for all inputs. Time display offset in seconds, specified as a nonnegative scalar. TimeDisplayOffset and TimeSpan are the values of their respective properties. scope(signal) displays the signal signal in the Logic Analyzer scope. 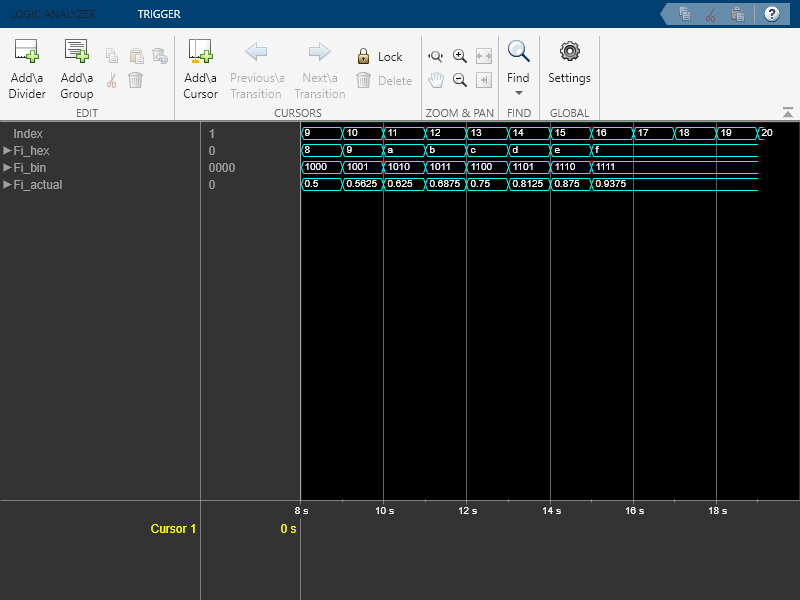 scope(signal1,signal2,...signalN) displays multiple signals in the Logic Analyzer when you set the NumInputPorts property to N. Each signal can have different data types and dimensions. 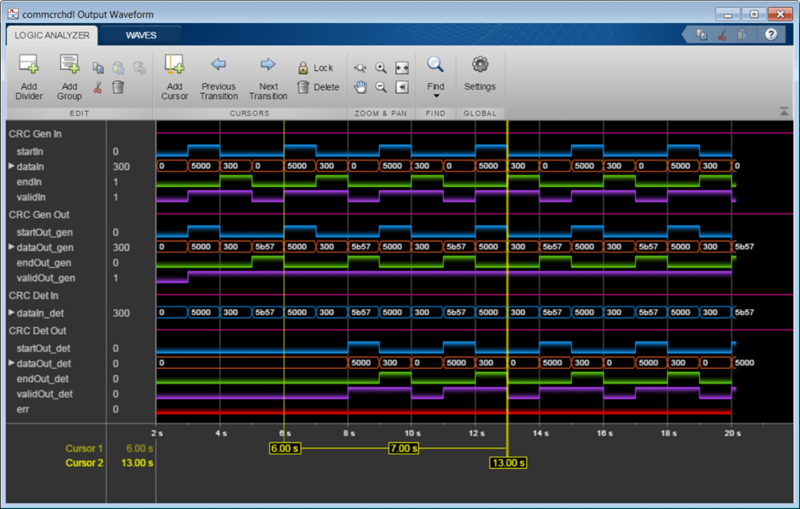 Specify one or more input signals to visualize in the dsp.LogicAnalyzer. Signals can have different data types and dimensions. Integers are supported up to 64 bits and fixed-point signals are supported up to 128 bits. Create a dsp.LogicAnalyzer object. Call the scope in a loop to display the signals. 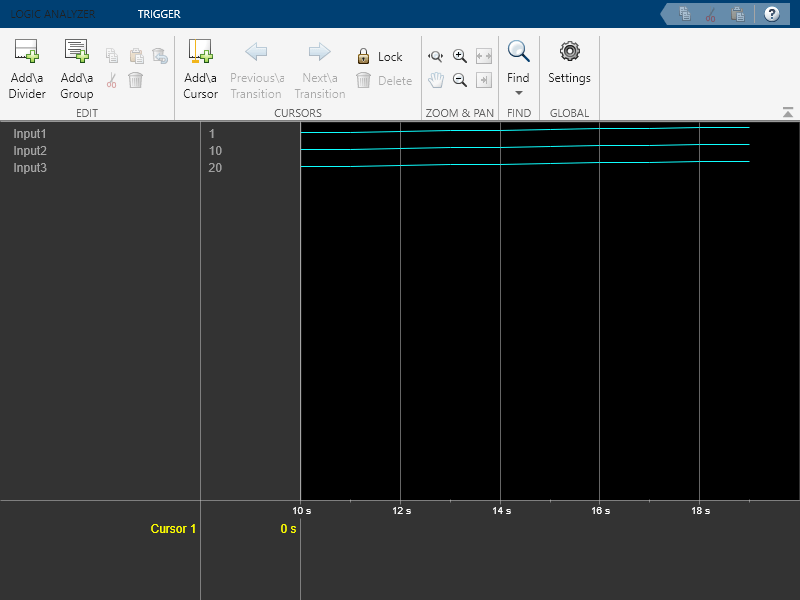 Create a dsp.LogicAnalyzer object with four channels. Call modifyDisplayChannel to set the radix of each of the channels. Run the scope in a loop to display the waves. Define a WeekDaysInt class to hold an enumerated list of weekday values. Create and save the following class definition file. Create a dsp.LogicAnalyzer object and configure the vector, complex, and enumerated data signals. Call the scope object in a loop to display the signals. To close the logic analyzer window and clear its associated data, use the MATLAB® clear function.